Hezbollah Monsters | Free Israel! Frida Kellner, 87, of Kiryat Ata died of a heart attack while taking cover in a bomb shelter during the rocket strikes on the Haifa suburbs. NEW YORK: A group of Americans, Canadians and Israelis who claim Hezbollah rocket attacks injured them and killed relatives have accused two banks of helping finance the terrorist attacks and have sued them for $650 million. The 85 plaintiffs say in court papers the American Express Bank Ltd. of New York and the Lebanese-Canadian Bank SAL of Beirut unlawfully transferred millions of dollars for Hezbollah between 2004 and 2006. “Why are they killing us? What have we done?” >asked Khalil Shalhoub as he witnessed his brother’s remains being removed from the building in Qana, Lebanon after Israeli aircraft bombed the building suspected to be shielding rocket launchers directed at Israel. 120 such rockets were fired at Israel today. Fox News reports that at least 56 were killed in the attack, mostly women and children. It’s a sad and tragic event which should never have happened. And it’s one that is likely to fit into the plans of those who wish to condemn Israel and push for a ceasefire that preserves Hezbollah’s military capacity. The same military capability which violates every previous agreement intended to bring peace to the troubled region. If you haven’t seen the video from the Israeli Defense Forces showing the launching of rockets directly behind a large building in the area near Qana, it is here. It’s an older video and apparently not the building which was struck today, but a nearby site which does illustrate how Hezbollah launches rockets from behind a large building to avoid detection. The chart at right illustrates the course of rockets fired from Qana. The Israeli Defense Forces also has a further video showing how Hezbollah hides rockets in civilian targets. More Questions: No Fighters Killed in Qana? Reporters at the site of this tragedy report that it took many hours for them to reach the scene. They were not given any opportunity to investigate, photograph or videotape obvious military targets or dead Hezbollah fighters. Prior to the strike in Qana, Israel took steps to warn the civilian population that strikes in this area were likely and warned them to leave. This is the same precaution they followed prior to their incursions into both Southern Lebanon and Gaza. These efforts include dropping of leaflets, phone calls to residences in affected areas and loudspeakers in some cases. Vital Perspective posted a copy of one of the leaflets warning that Israeli strikes were imminent. From reports at the scene, survivors of the Qana attack complained that they were unable to leave, that the roads were “blocked.” Yet reporters had no trouble getting to and from the scene. Unfortunately, the resources of the Israeli Defense Forces are more focused on fighting and winning on the ground in Lebanon and Gaza. But the propaganda war is being lost as the world sees images of dead children and only later considers the cause. As we wait for more information, one thing is clear: this tragedy would not have occurred if Hezbollah has been disarmed. Furthermore, this tragedy would not have happened if Iran and Syria had not provided Hezbollah with the weapons, training and funding to attack Israel. Finally, none of this would be happening if the world demanded the same level of accountability and respect for innocent civilians from Hezbollah that they require of Israel. Answering Khalil Shalhoub’s question: “Why are they killing us? What have we done?” I would say: You have allowed Hezbollah to rearm and attack Israel. If you valued peace more than war, you would not have done so. 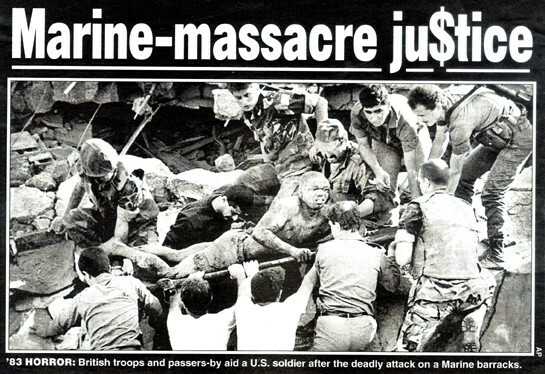 And Khalil: Mike’s America readers may recall another “Bloody Sunday” 23 years ago when Hezbollah killed 241 U.S. Marines sent to Lebanon as peacekeepers. Isn’t it past time you held Hezbollah accountable for the “cycle of violence?” Blaming everyone else for your problem hasn’t worked too well has it? Update: The research department at Flopping Aces has found a number of other links to the videos mentioned above and more. A number of these are provided by Vital Perspective, a collection of which can be found at You Tube. Vital Perspective also reminds us that the deliberate placement of weaponry in a civilian area is a violation of the Geneva Conventions. Will we now hear all the bleeding heart lefties who moan about our benevolent treatment of homocidal terrorists at Guantanamo now take up the call about war crimes by Hezbollah? Don’t hold your breath! And just for the record, Flopping Aces linked to this video at the end of which you can clearly see ambulances with UN markings being used to transport Hamas terrorists in Gaza away from the fighting. And some people say that Israel is committing “war crimes”? Israel’s war of not hitting Arab civilians VS Islamists FOR it. Since the bluff of Islamists supposedly having “issue” just keeps being exploded in their faces with each “one way” concession by the Zionists to the “never sattisfied” Arabs, more so when the Zionists gave Gaza land to the “Palestinians” and the “Palestinians” immediately responded only to continue their crimes with even less shame, overwhelmingly gave the region and to the world the gift of: electing officially the terrorists of Hamas to be their leaders. They never can justify their killing of civilians, intentionally, how do they combat with this most honest most human and moral basic question ever? So they came up with a plan, how to make sure their kids die, Hamas actually masterminded it, to use own kids as human shields, either firing with machine guns behind the “little stones throwers”, or firing from among their families. But great humane Israel (Israel VS Evil), can’t stomach even collateral damage, so they try always to warn the residents of an operation coming so that they should evacuate. That is of course extremely costly, since such warnings, whether in Gaza or in Lebanon are chasing the terrorists away as well, but beautiful Israel is willing to sacrifice so much to spare Arab children that their adults hate so much but love for them to be killed on the altar of “public relation” and that “victim-hood” so sacred for the dirty Islamists. If you want to see the deeper picture, (not only the true vs. exaggerated fake photos, just exposed on Reuters, etc. but) the real picture of Israel VS. Islamists. Israel fights so mighty hard to AVOID civilian casualties on EITHER side, Islamists fight for the GREATER MASSACRES of CIVILIANS even on Arab Muslim side, since it serves their purpose of: “you see? Zionists are killing civilians too, they are not much better”, so they can go ahead with what they always want, to massacre all non Muslims, especially the Israelis. SOMETIMES basic facts get blurred in a fierce, image-filled conflict such as the one spawned by Hezbollah’s July 12 cross-border attack in which Israeli soldiers were killed and others kidnapped while a rain of rockets descended on homes and fields. An unprovoked act of war, this Hezbollah assault followed 19 others since May 2000, when Israel pulled out from a security zone in southern Lebanon that had been created to protect against earlier terrorist incursions. In response to those first 19 incidents, Israel had essentially held its fire. What does Hezbollah, with some 10,000 katyushas and other long-range missiles, really want? Some say Israel’s pullout from south Lebanon was incomplete (though fully certified as complete by the United Nations) and that handing over Shebaa Farms would quiet the Iranian-funded Jihadist group. But as a New Yorker story noted, even Hezbollah spokesman Hassan Ezzeddin admitted: “If they go from Shebaa, we will not stop fighting them. Our goal is to liberate the 1948 borders of Palestine.” What he means, of course, is the destruction of Israel. Genocide seems to be the goal. This too may be lost when media focus centers on Israel’s retaliation for aggression and its army’s advance against Hezbollah fighters dug deep into the Lebanese hills. But listen to the words of the group’s leaders and consider the relentless message of Al-Manar, the organization’s richly funded satellite television network that reaches tens of millions around the world and is designated a terrorist entity by the US State Department. This blunt admission too should be remembered in the rush of reports; for there is, indeed, a crucial difference in valuing human life, whether Israeli or Arab. The innocent Lebanese behind whom Hezbollah gunmen wantonly shelter, knowingly inviting Israel’s defensive return volley, have surely been sacrificed. And not by their own choice. One news report told of Hezbollah murdering a Lebanese man who sought to flee the fighting and escape being used as a human shield. Lebanese citizens, especially Christians, speak of rage at Iran and Syria for the ruin of their country caused by Hezbollah’s proxy militia and of helplessness at the hands of the armed thugs. Many in the Lebanese Christian diaspora, beyond the reach of Hezbollah intimidation, speak out even more forcefully against turning Lebanon into a Shia theocracy emulating Iran. Israel has, in fact, tried to `”guard” the lives of Lebanese civilians, dropping warning leaflets and announcing ahead its intention to target missile launchers, explosives, and gunmen. In contrast, Hezbollah fills its katyushas with lethal ball bearings to spread death and suffering as far and wide as possible. A Boston native, David Lalchuck, was killed just days ago by this weapon as he rushed to safety from tending a kibbutz orchard. He was only the latest American to die at the hands of Hezbollah. Two-hundred-and-forty-one were killed in 1983 by a Hezbollah truck bomb at the US Marine barracks in Beirut. The Marines were part of a peace-keeping force. Until 9/11, Hezbollah had kidnapped, hijacked, tortured, and murdered more Americans than any other terrorist group. The Great Satan and the Little Satan — America and Israel — are the obsession of Hezbollah, Iran, Al Qaeda, and other Islamic fascists. Closing our eyes to their brutality only assures more innocent lives will be lost before the threat is overcome. (At the end… in 2007) Lebanon’s PM Lashes Out At Hezbollah Chief… The statement continued to say that one year after the war, Nasrallah was still making “excuses” for the war. Blame the Terrorists, Not Israel! THE HEZBOLLAH and Hamas provocations against Israel once again demonstrate how terrorists can exploit human rights and the media in their attacks on democracies. By hiding behind their own civilians, the Islamic radicals issue a challenge to democracies: Either violate your own morality by coming after us and inevitably killing some innocent civilians, or maintain your morality and leave us with a free hand to target your innocent civilians. This challenge presents democracies such as Israel with a lose-lose option and terrorists with a win-win option. Clash Pits Hezbollah Against Rule in Lebanon – New York TimesThe police said at least three people died and 100 more were wounded throughout the country in the violence. SWC News Items – Simon Wiesenthal Center– In 2004, Nassrallah said this: “We have discovered how to hit the Jews where … it is difficult to imagine a ceasefire in Hezbollah’s war against the Jews. – “If the Jews all gather in Israel, it will save us the trouble of going after them worldwide …” (Oct. 22, 2002). Argentina – …Hezbollah organization as the terrorist responsible …In late 2002, Argentina ‘s State Intelligence Service (SIDE) issued a detailed report, which was leaked to the media at the time. The report identified Iran. Iran tied to ’94 car bombing in Argentina… accusing him of approving the 1994 car bombing that killed 85 people. BAGHDAD, May 30 (UPI) — Iraqi President Jalal Talabani, in a Baghdad interview Friday, accused the leader of the Lebanon-based Hezbollah of meddling in Iraq’s affairs. Mahmoud Ahmadinejad was right to look smug at the end of his two-day state visit to Iraq. Not only did he become the first Iranian president to visit Baghdad, but he also took a big step towards achieving the victory that had eluded Ayatollah Khomeini, the father of the Iranian revolution. YouTube – Michael Ware on Hezbollah in Iraq A top Hezbollah leader has been captured in Iraq, offering more proof of Iran’s proxy war with the United States. July 2, 2007. Hezbollah, the Iranian-backed group in Lebanon that warred with Israel this summer, has been training militant Shiite cleric Muqtada al-Sadr’s militia both inside Iraq and in Lebanon, senior White House and intelligence officials confirmed Tuesday. The confirmation came after the New York Times reported that a senior intelligence official said that some 1,000 to 2,000 Shiite fighters had been trained in Lebanon by Hezbollah, which also is backed by Syria. Click here to view the New York Times article. President Bush, who is in Europe to attend a NATO summit, expressed concern Tuesday that Iran and Syria are both attempting to destabilize Iraq. “The Iranians and the Syrians should help — not destabilize — this young democracy,” Bush said. Bush continued to express his administration’s reluctance to talk with Iran and Syria on the grounds that the two nations have been unhelpful in efforts to achieve Middle East peace. The involvement of Hezbollah in Iraq. So it is not just the bloodshed in Somalia but in Iraq too, all those that were cheering (2006) to Hezbollah’s cruel tactics in Lebanon (to cause their brothers and sisters’ deaths) out of Anti Israel feelings, should know something about the global militant Islamic Mahdi army headed by Iran. Mughniyeh has the résumé to be a potent threat. He was the alleged organizer of a series of devastating bombings and kidnappings against U.S. targets in Lebanon during the 1980s, including two bombings of the U.S. Embassy in Beirut. But Hizbullah later made a strategic decision to abandon attacks on American targets. Even now, U.S. intel officials stress that they don’t believe Hizbullah will actually hit U.S. interests unless Washington strikes first—against either the movement or its key patron, Tehran. Killing Mughniyeh – HUMAN EVENTS Feb 25, 2008 … Imad Mughniyeh died on Feb. 11 the way he made so many others die. …. the monster does eventually run out of brains and blood. This entry was posted on June 9, 2009 at 11:35 am and is filed under Hezbollah, Iran, Islamofascism, War on terror. You can follow any responses to this entry through the RSS 2.0 feed. You can leave a response, or trackback from your own site.